That’s acclaimed writer Wade Rouse on his and his partner’s decision to move to our little neck of the woods. It’s part of his hilarious and mishap-ridden memoir At Least in the City Someone Would Hear Me Scream, a brilliant account of his bumpy transition to country life in a cottage in Saugatuck. Well, the years have passed and Wade spends every summer here and has truly become a part of the community. And now he’d like to share his writing expertise here through a writer’s workshop he’ll present at The Kirby! On Saturday, November 7th Wade will lead guests through a guided writing course that will help any aspiring writer begin to take steps to pursue their dream – whatever that dream may be. By the end of the day, you’ll have the tools you need to start your own personal blog and you’ll even begin blogging while you’re here. And rest assured that this is no ordinary, dry class; it’s a unique experience that is meant to not only give you practical advice on how to launch your writing career, but also to fill you with creative inspiration. The day will also include a Meet & Greet reception, gourmet lunch, a sommelier-guided wine tasting, delicious dinner and refreshments during the day, so there will be plenty of opportunities to relax and enjoy the beautiful surroundings as you learn and write. Of course, we recommend making a little vacation out of it and staying the night or the weekend right here! We’re even offering workshop participants 20% off our normal room rates. This way, newly inspired writers can take an extra day or two to write in a tranquil and beautiful environment away from it all. The workshop enrollment fee is $225 per person and includes all of the exciting events, food and drink mentioned above. But space is limited to just 40 people and our 7 guest rooms will book quickly, so make sure to reserve your spot before it’s too late! 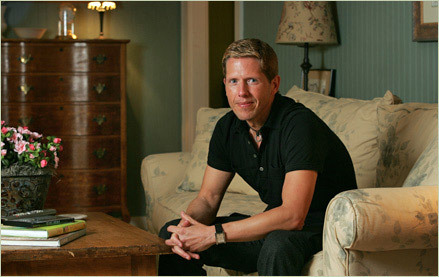 To learn more about Wade Rouse, click here to visit his site. And to book now or for more info, call Mindy at The Kirby at 269-857-5472.